The GE Simon XT wireless security system is cost effective and easy to install and use. The Simon XT supports up to 40 wireless zones using GE wireless SAW or Crystal transmitters. This kit includes 3 wireless door/window sensors, a wireless pet immune motion detector and a wireless keyfob. 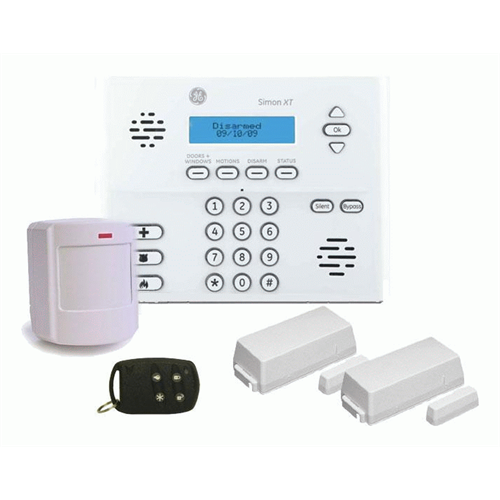 You can easily add additional GE wireless sensors or a secondary keypad. The Simon XT features voice prompts and remote telephone control functions for arming, disarming, status, and latchkey functions. The latchkey features can be set to notify parents if the system has NOT been disarmed by a certain time. It can notify the owner of an alarm by calling a landline or cellular phone using voice alerts or it can be professionally monitored.